Last week PNE Industries reported its results for the first half of fiscal year 2016 (that ends 31 March). The half-year report is not a whole lot more than simply the income statement, balance sheet and the cash flow statement for that period, so it’s not the most informative. But the numbers are the most important anyway, and they look good. Revenue is up 1.5% while the cost of sales dropped 6.1%, making gross profit jump with 21.9%. 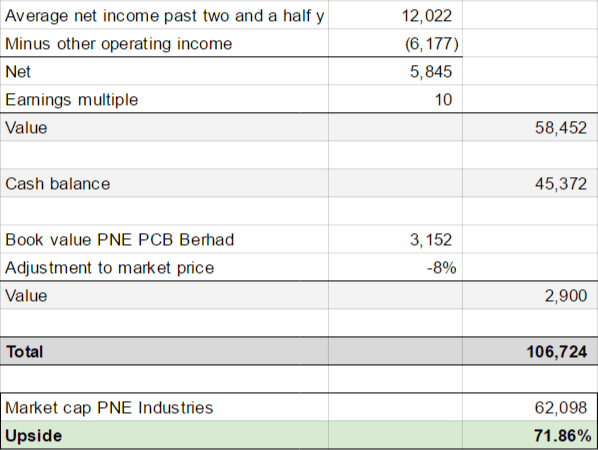 Because the sale of the PNE Print subsidiary was completed in April, after the end of the reporting period, the S$10.26 consideration is not yet reflected in the financials. I have revised my valuation of the company upwards with a bit more than 10% to account for the solid profitability of the past six months. In the meantime the share price has risen with almost 25% which obviously reduces my perceived upside of the stock, but I think there is plenty of upside remaining. This entry was posted in Portfolio and tagged BDA.SI on May 17, 2016 by Alpha Vulture. What is the adjustment for other operating income? This is operating income that shouldn’t be considered as recurring, it’s mostly FX gains and a gain on the sale of an associate.